The Reach Toothbrush is made for your mouth. 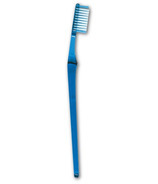 Angled like a dental instrument, it cleans even the places that are hard to reach, giving you superior plaque removal. The Reach brand also carries an entire line of brushes and flosses designed to provide oral care for your individual needs. Upgrade your brush today!